We are Paula and Bert Morgan, residents of Ridgefield, Washington. and is convenient to most of the Northwest. what to look for in a good breeder, and other related subjects. 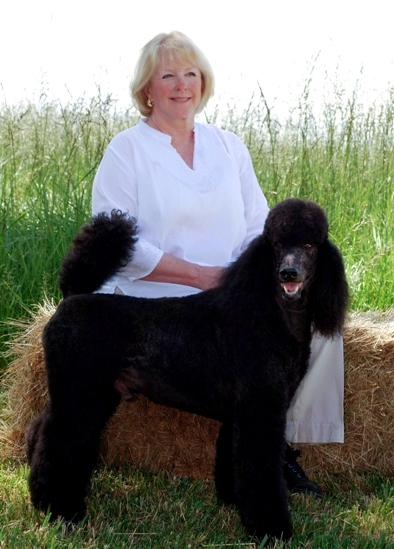 Ardent Standard Poodle breeding and puppies. What are they like? First and foremost, Standard Poodles are dogs that have been bred as companions, and they really want to be with their people. This is not a breed that does well being left alone for hours at a time. If you have commitments during the day that exclude your dog being with you for longer periods, you should arrange for other companionship and activity for your dog during that time, or consider another breed. They are great outdoor dogs - and great indoor dogs. Well into middle age, they do require the opportunity to run. They will go out and run and play for as long as you will go with them, then they will come inside and lie quiety at your feet (although they would much rather snuggle in your lap!) They have no idea they are too big to fit entirely on your lap . . . They are very playful dogs, and usually stay "puppy playful" most of their lives.They are sensitive and intuitive, active and loving, the perfect living teddy bear. Standard Poodles were originally working water retrievers, but for many years, have been primarily bred as elegant companion pets. The Standard variety was the original Poodle size, with the Miniature and Toy varieties being bred down in later years. Today, they can be seen showing in most major competitive events. They excell at agility and obedience. They are serious competitors in hunting trials and there are several breeders that pursue breeding lines strong in working retriever ability just like their original ancestors. The origin of the fancy show clips that are required for conformation dogs over the age of one year is derived from the need for a clip that would allow the legs and hindquarters of the dog freedom to swim, but give the major joints, and heart, lungs and head, some protection from icy waters. What IS with that hair? It is a pain to deal with? The Poodle coat is absolutely irrisistable to touch, pet and cuddle! It is positively therapeutic. And it really does not shed. But one aspect of this non-shedding coat is that it also never stops growing, so your dog will become an immense, hairy (and matted) beast unless the coat is trimmed and groomed regularly. So owning a Poodle does require a committment to either regular visits to a groomer, or having the time and interest to learn to groom at home (not really that hard). And since grooming is a requirement, show off your Poodle! A proper Poodle groom features a clipped muzzle, feet and base of tail, with some length of hair on the top of the head. The remainder of the dog can be in any trim you like, from the lovely all one length lamb cut, to more intricate patterns. What else should I know about Standard Poodles if I am thinking of getting one? ​ While they will conform to whatever you are doing in their habits, they are larger, athletic dogs and they do like exercise. They love retrieving frisbees or similar play for a good workout. When your Poodle is young, they will want at least one or two sessions a day that is more than just walking on a leash. Many people are surprised at the guard dog instincts displayed by some Standard Poodles (there is a great range in the breed on this trait - from loving to everyone to more territorial and protective in the home). Away from home they are usually sweet with strangers, and many Poodles serve as therapy dogs. But most Poodles want to protect their own property with, at a minimum, excited and loud alarm barking when visitors approach, and occasionally more threatening behavior. ​ Standards are very smart dogs. They learn quickly and easily, especially if approached as play - you are almost not aware you are "training" them. Smart dogs can also get bored and get into mischief. They like toys to play with, an agenda for the day, and some serious interaction time, just as any dog does. Most Standards do bark to sound alarm, especially if you have more than one, and it is a big bark. Mostly, however, they want to be with you and do whatever you are doing. Poodles thrive on your attention and interaction with them. These dogs want to be next to you at all times and will follow you from room to room. If you would find that a bit much, this is not the dog for you. What should I know about a breeder when I am looking for a puppy? Reputable breeders carefully chose mates on the basis of pedigree, conformation and temperament - that is, they will have reasons why they bred these two specific dogs to each other, over and above convenience and the fact that they both have positive qualities or accomplishments. A serious breeder will know the strengths and weaknesses of the sire and dam and will be striving to increase the predictability of results and conformance to the breed standard, with the particular breeding. Standard Poodles are a generally healthy breed with fewer inherited diseases than many other breeds, but the ones that they can have are serious, so do make sure parents are tested, and avoidance of affected breeding lines is a goal of your breeder. Reputable breeders will have completed testing on both the sire and dam for several genetic health issues that have occurred in Poodles, and/or in the breeding lines they are using. Recommended tests include Von Willebrands, sebacious adenitis, thyroid, eyes (parents whose eyes have been examined will be registered with CERF) and hips, either OFA or Penn Hips method. Tests are also available for degenerative myelopathy, neonatal encephalography, as well as atrial septal defect, which have been found in some lines of Standards. Tested dogs will have a printed report and usually the testing information can be accessed online through OFA and/or CHIC. Ask the breeder if you can see copies of the reports on health testing done for both parents. If these cannot be produced, find another breeder. Also ask the breeder if the dogs they are breeding have ever to their knowledge produced a dog with Juvenile Renal Disease, Epilepsy with seizures, Sebaceous Adenitis or Addison's disease. These serious conditions unfortunately do not yet have a genetic test. Ask to see the dam, and the sire also if he is available, and focus on the parents, not the cute puppies. Use some common sense. Are the dogs healthy-looking and attractive to your eyes? (Your puppy will eventually look like one or both of them, after all!) Do they have good, thick hair coats? Clear eyes and skin? Good stifle and hock angles? Do they move freely and easily, without stiffness? Are they friendly, alert and interested in you, or are they shy and skitterish? It is not uncommon for adult Poodles to be a little reserved with strangers, at least at first, but they should have dignity, confidence and interest. Puppies should be friendly and playful. You do not need to be an expert to evaluate these simple things - just pay attention and notice these characteristics in the parents and pups. One thing that can be very important for new puppy owners is the level of support and advice available from a breeder after you take your puppy home. If you are already an experienced Poodle owner or interested in a rescue, this may be less important to you, but if you do want to have ongoing support for Poodle issues and questions, make a note of how available, knowledgeable and responsive the breeder is in your pre-purchase conversations, and see what you can find out about how this continues after purchase. Finally, about guarantees. Many breeders give a "guarantee" for health and temperament issues. This is usually limited to only certain specified conditions, for a specific period of time. In most cases, the remedy is limited to returning the dog (it will usually be one to five years old before you know you have a problem) and/or being allowed to take another puppy whenever another litter is produced. While this is standard, it is not a remedy that is actually very helpful for most people. What you really need help with is vet bills, or the cost of a new puppy from another breeder. For this reason, at Ardent we provide not only the usual guarantee of a new puppy, but alternatively, a $1200 refund in the event of a material genetic health problem. Buyers should be aware, of course, that no breeder can "guarantee" that any dog will stay in perfect health all his life. Any dog, just like a human, can face many different health issues over the years. And probably any breeding dog, if bred enough, will eventually produce one or more puppies with some type of genetically-influenced disorder, no matter how carefully screened and tested the ancestors are. We do recommend that puppy buyers look into health insurance for their dog, and see if that is a viable option. What if I want to breed my puppy some day? The AKC encourages breeders to sell puppies on "limited contracts" (any resulting litter cannot be registered). Most breeders go further and require proof of spay or neutering of dogs sold on "pet contracts." Breeders are concerned that irresponsible breeding will undo their work to improve the breed and damage the reputation of their stock, as well as contributing to overpopulation problems, so their willingness to sell puppies with full breeding rights ranges from none at all, to extremely limited. Another issue is the popularity of crosses such as "Labradoodles", "Goldendoodles" etc. Most breeders are adamantly opposed to such "designer dogs" and are horrified at the thought that any dog they produce might ever be so used. If you truly want to breed your Standard Poodle, be prepared to show your seriousness of purpose, your committment to the breed, and to showing your dog to championship. On the other hand, "backyard breeders" may care little about your qualifications as a pet owner and intentions for your puppy; only your ability to write the check. If you find you are talking with a breeder of this type, and the price is appealingly low, be particularly careful about the quality and health testing of the dogs involved. OK, what exactly is so wrong with Labradoodles etc. anyway?? Ah, here is a page in itself. Too much to talk about here - see the Ardent Blog page about this, shelter dogs and other subjects! What kind of breeder is Ardent Standard Poodles? We are a small breeder (generally one litter a year) of show-level and companion Standard Poodles. Our dogs are usually of medium size. Our goal is producing superior quality as measured by a specific breed standard. We have been designated an AKC Breeder of Merit. We do not cross-breed. If you are interested in cross-breeding, we urge you to first adopt half a dozen or so cross-bred dogs who are among the many waiting for homes. Our dogs all live with us in our home. They are spoiled rotten, but they behave quite nicely, nevertheless! (Or so we are told.) Our breeding dogs are health tested and matched by pedigree and type to produce the result we are looking for in our over-all, long term breeding program. We provide a unique health and temperament guarantee. We will ask about the suitability of a potential puppy buyer as a home for a Standard Poodle. We care about the matching of a dog to an owner, based on our extensive work with the puppies and the lifestyle and preferences of the buyer. Our puppies are well socialized and introduced to crates. We do early neurological stimulation exercises before they are walking. We carefully observe each puppy and keep daily notes on its progress and personality. Puppies have their tails docked, dewclaws removed, are wormed at four and six weeks, and are introduced to grooming and clippers. Shots will be done in consultation with the new owner. When their eyes are open and they are walking, they are allowed to freely go outside to play, from their inside "habitat." This allows them to follow their natural instincts to pee and poop away from their indoor sleep area, and helps with later potty training. The puppy will be registered at the time of going to its new home, with the name of the buyer's choice (show contracts may have individualized terms). We are available to our puppy owners during the life of their dog, for advice, evaluation, and whatever assistance it is in our power to provide - sometimes even puppy-sitting! 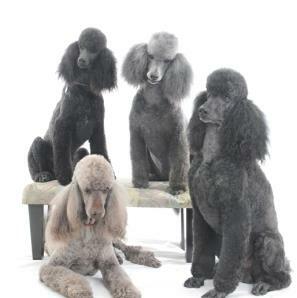 We have owned, studied and shown Standard Poodles for some years. Paula has had experience breeding Airedales in years past, and Paula and Bert have had sustained success in breeding AQHA cutting horses and gaited Rocky Mountain Horses at the highest levels. We have carefully chosen the dogs used in our breeding program, and are continually striving to improve. We desire to breed for all the traits that make for a wonderful pet and companion, as well as a show level dog, and we are especially interested in great, "Poodle-ish" personalities, health and soundness, strong and exciting movement, and an all-around beautiful dog. 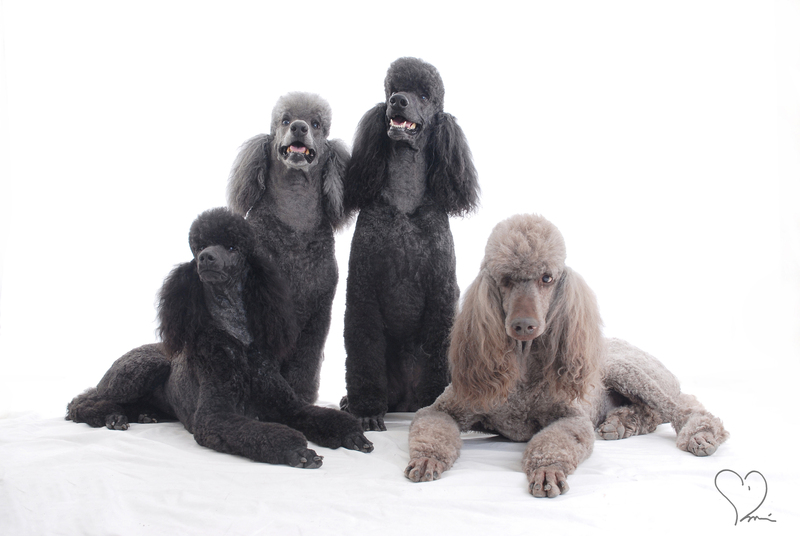 We hope that you will give us a call if you are interested in the best of the Standard Poodle Variety! 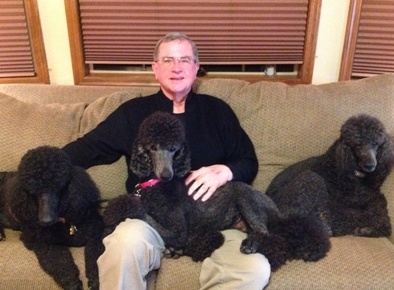 Member: Columbia Poodle Club, Inc.
Bert gets company watching the Super Bowl. 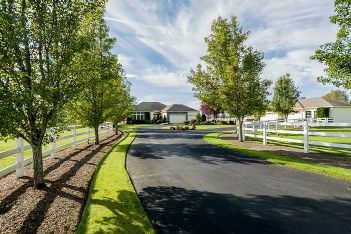 Our home in Ridgefield is the site of our annual late summer Poodle Palooza benefit party for all Poodle enthusiasts! Ask us about it!